In this lesson, I will show you exercises to improve your dexterity and co-ordination on the bass. For more information and exercises to play in this style be sure to check out our new book Bass Technique Finger Gym. The examples featured in this lesson focus on how to improve your dexterity and coordination, to quickly warm upyour fingers. Focus on these points when learning the following examples. 1) Ensure there is space between the fingers of your fretting hand. By learning to play these examples with room between your fingers, you will develop strength in the correct tendons and muscles of the hand. 2) Keep your knuckles upright at all times. 3) Each finger should stay in one designated fret (the one-finger-per-fret rule; see below). 4) Aim for minimal movement in your fretting and picking hands. 5) Stop if you feel any pain. “No pain, no gain” is never the way forward. Stretch thoroughly before you play the examples in this chapter and stop if you feel any strain. It can be as simple as pushing the fret too hard when you are playing, so stop what you are doing and reassess your technique if you are in pain. Examples 1a to 1f are designed to warm up individual finger groupings. Make sure you stick to the finger-per-fret method mentioned above when playing through these examples and use a metronome at all times. Use your first and second fingers to play example 1a. You may recognise these notes when played like this as they are used to create tension in the film Jaws. Play example 1b using your first and third fingers. Now play example 1c with your first and fourth fingers. Complete example 1d with your second and third fingers. Play example 1e using your second and fourth fingers. This may require a little extra practise than the earlier examples, so take it slowly and make sure you feel just as comfortable playing this example as you do the previous ones. Play example 1f with your third and fourth fingers. As with the previous example, start off slowly at around 50bpm and make sure you can play it five times perfectly before you increase the metronome speed. Example 1g is a popular warm up as it uses all four fingers across all four strings. Make sure you can hear each note clearly without any accidental muted notes. Example 1h is the reverse of example 1g. Starting on your fourth finger is a little trickier than beginning on your first finger, but with regular training, all your fingers will become equally dexterous. A special thanks to Danny Cross for recording the audio. 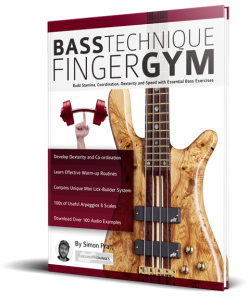 This lesson is taken from Bass Technique Finger Gym, it’s available now from Amazon.